The 1950s saw an explosion of all things ballet in popular culture. One of the most prominent artists was Carlotta Edwards (1894-1977). Edwards was the daughter of the French painter Ferdinand Pourrier. Her ballet scenes once graced the bedrooms of little girls (and big) all over England but were very popular in Australia and New Zealand. 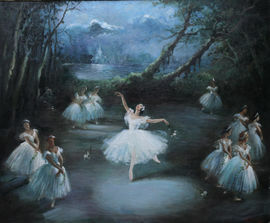 Edwards appears to have based most of her pictures on photographs of popular British dancers.